Pueblo textile artists have used a variety of fabrics and yarns over the centuries, depending on what they could manufacture or obtain through trade. Although Spanish demands for tribute forced Pueblos to abandon earlier, sophisticated weaving techniques, they also gained access to wool through the importation of churro sheep. The new source of fiber had many benefits: it was easy to process and spin, it was strong and durable, it was warm, and it was easily dyed. Pueblo peoples began to have access to sufficient quantities of wool and sheep for personal use by the late eighteenth century. Later, trade with the Americans to the east brought machine-woven cloth and yarns to the Southwest. In the twentieth century, acrylic yarns and other new materials became widely available. For a time during the first half of the twentieth century, Pueblo embroiderers used grain or flour sacking as a background cloth. Several examples of smaller items, such as sashes, kilts, and even an occasional shirt, made out of these sacks still exist. To use the cloth, the embroiderer usually picked out the contrasting colored threads that had been woven in to produce stripes in the original sacking. 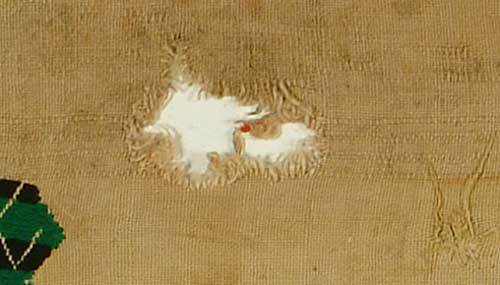 Once the embroiderer eliminated the stripes, he or she had a nice white cloth suitable for embroidery. These sacks are no longer available. Whereas it is very difficult to find a good wool background fabric, suitable machine-woven cotton fabrics are available to the contemporary embroiderer. This yardage, referred to as “monk’s cloth” or “manta cloth” is hard to find and fairly expensive, but it is wide enough to be used to make a full-sized dress manta. Smaller cuts serve as kilts or sashes. It is 100 percent cotton, woven in either a balanced plain weave (over one, under one) or in a balanced basket weave (over two, under two). “Balanced” means that neither the weft nor the warp predominates, so the cloth has a nice, even checkerboard upon which the embroiderer can work. As soon as manufactured yarns became available in the form of raveled cloth or imported European yarns in the nineteenth century, embroiderers began to use them in the Pueblo stitch. Changes to the Pueblo stitch only began to occur with the advent of the domestically manufactured, aniline-dyed wool four-ply, often referred to as “Germantown yarn.” The basic steps of the stitch remained the same, but the embroidery yarn itself was handled differently. 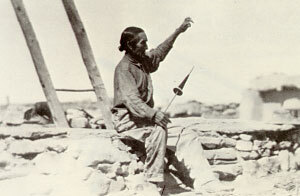 A Hopi man spinning with a stick and whorl spindle (c. 1917). Sometimes the four-ply yarn was re-spun and used doubled and the needle pierced the yarn. In other cases, the embroiderer did not re-spin the yarn, did not double it, and used it in a fluffier state. The embroiderer might pierce the yarn with the needle or not, depending on the individual’s technique. Rarely, the four-ply strand is separated into two two-ply yarns (much as cotton embroidery floss is separated) and then used in any of the preceding variationsdoubled or single, re-spun or not, pierced or not. Contemporary embroiderers use several different types of yarn. 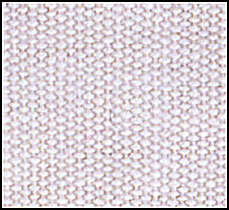 The easy availability of acrylic yarns makes them popular. Some people prefer to use the four-ply wool yarn first made in the 1860s, but it was almost impossible to find between 1980 and the mid-1990s. No domestic mills manufactured this product and foreign imports were hard to find. Happily, wool four-ply yarns became available again in the late 1990s. Embroiders re-process the embroidery yarns by hand before using them. Most often, they re-spin the yarn to make it tighter. Then they soak it in water and allow it to dry so that it is set. Occasionally, the artist will split the four ply yarn into two plys.